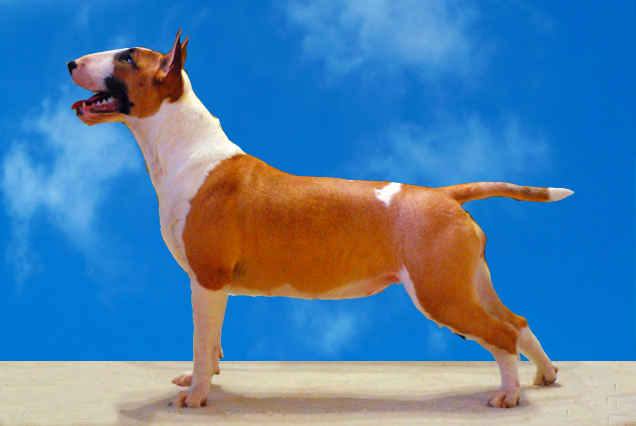 The breed was initially bred to be a fighting dog in England. Even though that practice was banned, the breed today maintains that desire to pick a fight with other animals. It is stoic, ultra strong and will not give up. The Staffordshire Bull Terrier has more stamina than Rocky Balboa! It is built like a Sherman Tank with that muscular, compact body of theirs! I have treated few of these dogs. I do remember when I was a kennel boy working for a veterinary practice in NJ that we boarded a Staffordshire Bull Terrier named “Alfred”. He was the typical black spotted on white dog. He actually was a nice dog but if he was provoked or saw another dog go by, he would attempt to chew up the stainless gate of the cage! A STAFFORDSHIRE BULL TERRIER IS NOT AFRAID OF ANYTHING! The Staffordshire Bull Terrier does really well with children and is dedicated to the family members. If you want to own the Staffordshire Bull Terrier you have to be careful of the dog around strange people and other dogs. This breed has no fear! Being a breed of medium size, they do well in a city or suburban setting. The Staffordshire Bull Terrier needs plenty of exercise and loves to run in open spaces. It can live in any environment but would prefer a suburban or rural setting. From a medical perspective there are very few, if any, issues associated with the breed. They are very healthy for a terrier. If you have the time to exercise the breed and control its aggressiveness towards other dogs and strangers, the Staffordshire Bull Terrier might just be right for you! Learn more about the Staffordshire Bull Terrier at Animal Planet’s® Dog Breed Selector.